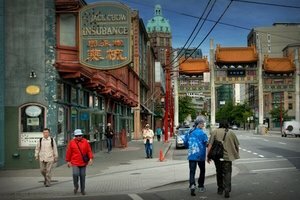 Vancouver is a truly wonderful city with a vibe of its own. For the outdoorsy folk, there are the stunning parks, gardens, and picturesque beaches. 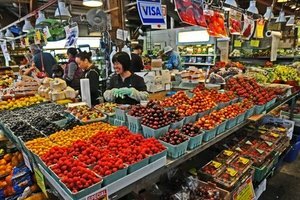 For the foodies, there’s Granville Island, which also caters to art lovers too. Sports and music fans can enjoy world-class events at one of the many venues on offer and if you’re looking for culture be sure to visit the museums. 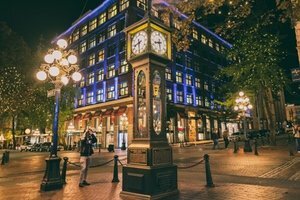 We worked hard to put together a comprehensive collection of our favorite spots and while this isn’t meant to be reflective of everything to do and see in Vancouver, nor in any particular order, it’s a fantastic starting point to base your stay around. 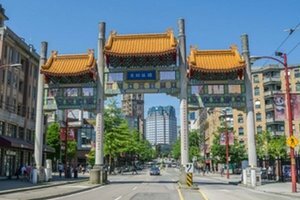 If you truly want to experience this city in a more intimate way, we strongly recommend booking a private walking tour in Vancouver with us. 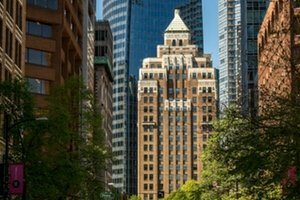 We will be happy to work with you to create the most amazing experience for your time in Vancouver and have included our itineraries to give you a better understanding of some of the things we cover. 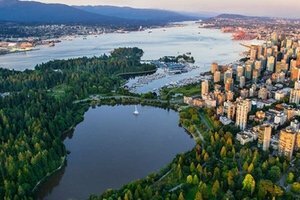 Explore the 400-hectare natural West Coast rainforest and enjoy scenic views of water, mountains, sky, and majestic trees along Stanley Park’s famous Seawall. Discover kilometres of trails, beautiful beaches, local wildlife, great eats, natural, cultural and historical landmarks, along with many other adventures. 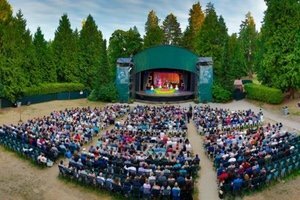 Home to Theatre Under the Stars (TUTS) this 2000-seat outdoor theatre in Stanley Park also hosts rock and pop concerts during the summer months in between theatre productions. 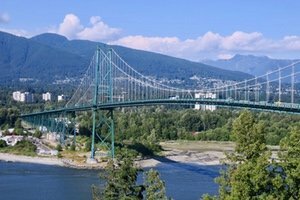 Officially the First Narrows Bridge, Lions Gate Bridge is a suspension bridge linking Stanley Park with the North Shore. Named after a pair of mountain peaks, the bridge is flanked by two cast concrete lions on the southern side. A research center and public aquarium located in Stanley Park. 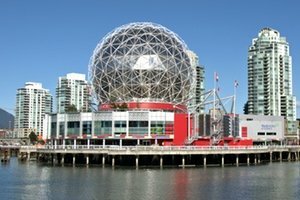 Vancouver Aquarium is first and largest aquarium in Canada and unfortunately was the first to capture and display orcas, a practice it has now ceased due to public pressure. 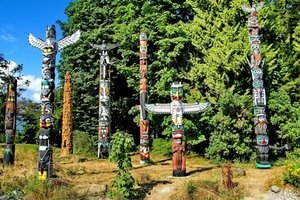 Likely the most popular attraction in Stanley Park are the nine totem poles in front of the Brockton Point Visitor Center. These intricately carved poles are replicas of the original First Nations works, each telling a unique story. Possibly the cutest little ferries in the world! 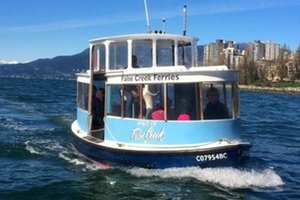 A great way to get to Granville Island or Science World from many areas around False Creek. See the city from a totally different perspective. You would never know it now but this gorgeous park was once a giant quarry, used to build the Vancouver’s first roads. It is now 130 acres of pristine parkland with a wonderful conservatory as it’s crown jewel. 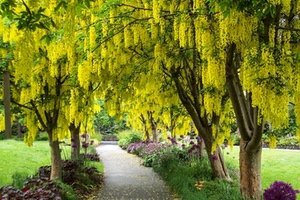 One of the many parks and gardens in Vancouver, VanDusen Botanical Garden is a 55 acre oasis with over 7,000 species of plants from all over the world. Be sure to check out the orchid-shaped Visitor Center which was awarded the Most Sustainable Building in 2014. Whenever the sun’s out this place gets jam-packed with locals looking to enjoy the weather. 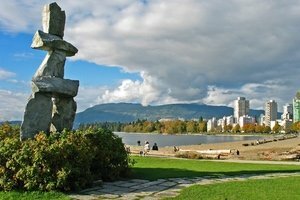 Located on the cusp of Stanley Park and the West End this is a great place for walking, biking, swimming, or just chilling out. Don’t miss the traditional stone Inukshuk and if you happen to be here over summer, there’s a spectacular fireworks display. 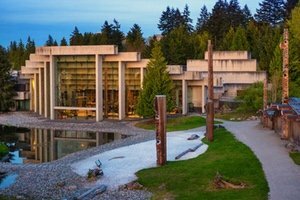 If you can only visit one museum in Vancouver, the Museum of Anthropology has to be at the top of your list. 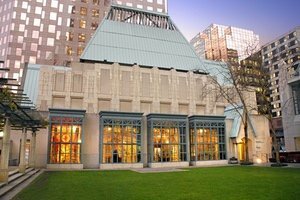 With amazing displays of world arts and cultures, particularly works by First Nations, the museum is home to an astonishing 500,000 + objects. 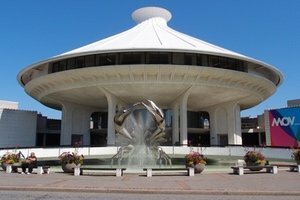 The Museum of Vancouver is an award-winning history museum and the largest civic museum in Canada. Built on traditional, ancestral land, the museum focuses on local exhibitions and programs. The distinctive roof was designed to look like a woven basket hat made by Northwest Coast First Nations people. 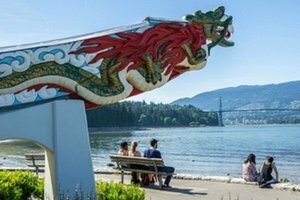 Facing English Bay you will find Kitsilano Beach, a popular destination for locals to play sports and hang out. 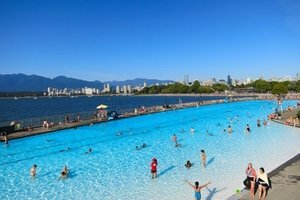 The beach is also home to the longest swimming pool in Canada measuring a whopping 137 meters from end to end. 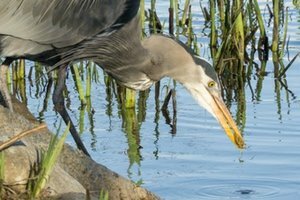 If you’re hoping to spot some wildlife while wandering through Stanley Park, this is the place to be. You will see all sorts of birdlife, squirrels, raccoons, and maybe even the tiny chipmunk. Previously a tidal mudflat, Lost Lagoon was formed when the Stanley Park causeway was built in 1938. 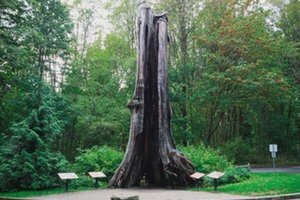 The Hollow Tree is the remaining, hollowed-out, stump of a 600-800-year-old Western Red Cedar tree. 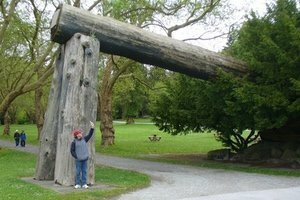 Is has been a popular attraction in Stanley Park for over 100 years and still draws hoards of visitors looking to snap a photo with this behemoth. 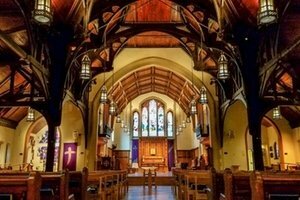 Opposite the Fairmont Hotel Vancouver, you will find the wonderfully-restored Christ Church Cathedral. This Anglican Cathedral houses a 2500 pipe organ and several artworks by Bill Reid hang near the entrance. Our favorite art deco skyscraper the Marine Building is a stunning piece of architecture that was once the tallest building in the British Empire. Step inside the main foyer and be treated with ornate sculptures, mosaic tiles, and colorful stained glass windows. 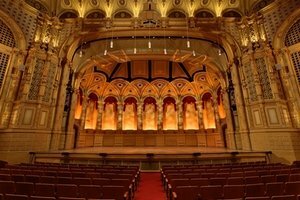 Home to the Vancouver Symphony Orchestra, the Orpheum Theatre is a landmark building on Granville Street in what is known as the ‘Entertainment District’. It’s not until you step inside until the true beauty of this building reveals itself so try to catch a show if you can. 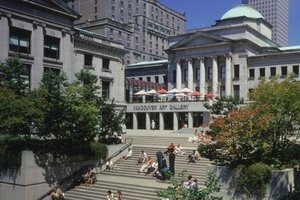 Located in the center of downtown, the Vancouver Art Gallery has a permanent collection of over 11,000 artworks, including major pieces by Emily Carr and other notable artists. This indoor sports stadium is known mostly as home to the Vancouver Canucks ice hockey team but it was also once home of the Vancouver Grizzlies NBA basketball team which moved to Memphis in 2001. The arena also hosts music concerts and other events such as Nitro Circus. Built for the 1986 World’s Fair, commonly known as Expo 86, this geodesic dome was designed to serve as the Expo Center. After Expo finished, the building was converted into a Science World as it is used today. The 3D IMAX theatre is a highlight along with a large variety of hands-on exhibitions. 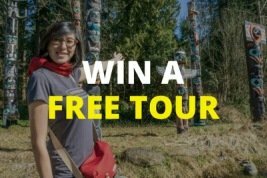 The only public art gallery in Canada that is dedicated to showcasing contemporary Indigenous Northwest Coast artworks. Bill Reid was an acclaimed artist whose work can be seen throughout Vancouver. 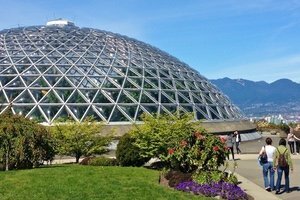 At the peak of Queen Elizabeth Park, you will find this large dome conservatory with over 500 varieties of tropical plants and 120 exotic birds. An excellent place to visit when the rain is falling. Foodies from everywhere flock to this incredible farmer’s market on Granville Island. A wonderful selection of shops and stalls highlighting the gastronomic delights of this north-west region. Prepare your taste buds for a treat or ten. The markets do get busy in the summer months and on weekends so try to avoid peak times. 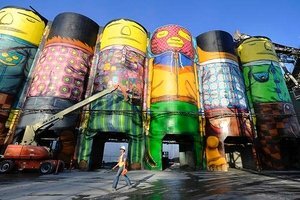 Another great reason to visit Granville Island is the art district. Wander the narrow alleys and stop by some of the artisan stores and workshops. See glass and metalwork, leather and textiles, ceramics and pottery, painting, sculptures, aboriginal art, and a whole lot more. 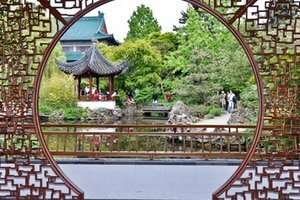 The first ‘Chinese scholars’ garden built outside of China. Dr. Sun Yat-Sen was a Chinese physician and philosopher often referred to as the “Father of the Nation”. 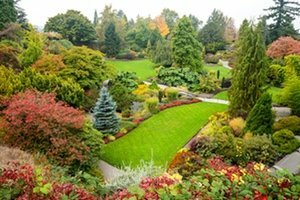 The gardens have been named one of the Top Ten City Gardens by National Geographic. There is a free section and a paid section. 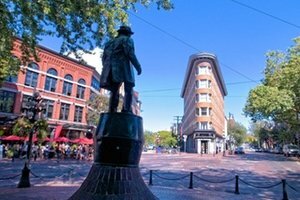 This monument is dedicated to the namesake of Gastown, John Deighton who was more commonly known as “Gassy Jack”. In 1867 he opened a bar nearby called the Globe Saloon which was a popular establishment with the sawmill workers. This historic steam-powered clock is a popular attraction with tourists. There’s a whistle that sounds every 15 mins, complete with bursts of steam from each of its five whistles leading up to a special sequence that plays the Westminster Quarters on the hour. 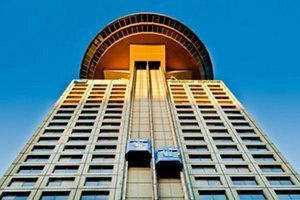 Take a 40-second elevator ride to the observation deck for a 360-degree aerial view of Vancouver. Look out to the mountains, over Stanley Park, and Downtown Vancouver. 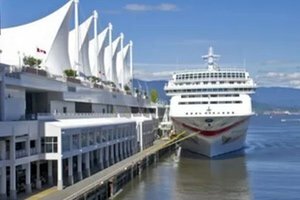 Vancouver’s cruise ship terminal and convention center. The building was designed to look like a boat with fabric roofs resembling sails. These white sails are a prominent landmark for the city and some people draw comparisons to Sydney’s iconic Opera House. 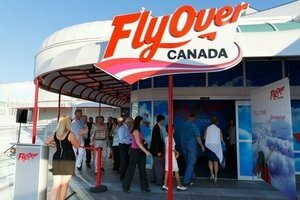 An audio-visual and sensory attraction that has you hanging suspended in front of a 20-meter spherical screen giving you the feeling of flying over Canada on a thrilling 8-minute ride from east to west. 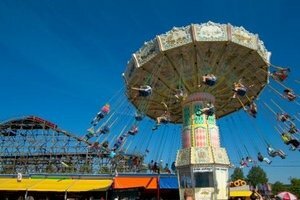 The oldest amusement park in Canada with roller coasters and other exciting rides for a fun day out. Open from late May to the end of September. What better way to see the city than by air. 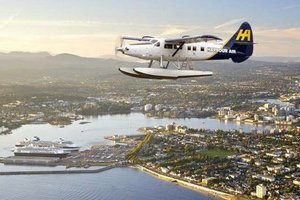 Harbour Air operates daily scenic flights from Coal Harbour that are sure to give you the thrill of a lifetime. The feeling of skimming along the water for take-off and landing is truly something else. Just outside of the city you will find this 140 meter-long suspension bridge stretching across the treetops of a rainforest. The original bridge was built in 1889 and made of hemp ropes and cedar planks. 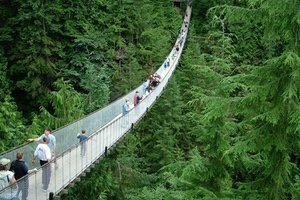 Once on the other side of the bridge, you’ll navigate a series of elevated walkways through enormous Douglas Fir trees. 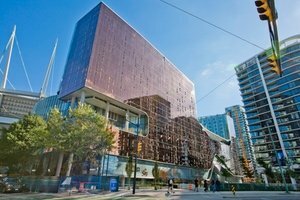 A huge entertainment destination next to BC Place with Vancouver’s only downtown casino. A great option for some nightly fun as they have a large selection of slots and table games (don’t lose it all). 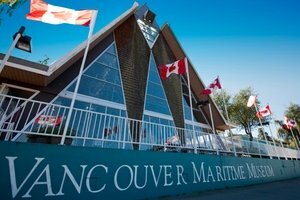 Located in Vanier Park, the main exhibit is the St. Roch, a Royal Canadian Mounted Police arctic exploration vessel. The museum also has a range of model ships including a model of the Vengeur du Peuple which was built by prisoners of war around 1800. 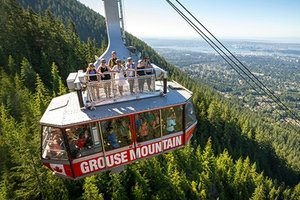 Grouse Mountain is an alpine ski area overlooking the entire Vancouver area. During the winter months there are 26 ski runs and in the summer months, the resort features lumberjack shows, wildlife demonstrations, and a scenic chairlift ride. If you’re feeling adventurous, hike the 2.9 km trail known as the Grouse Grind. 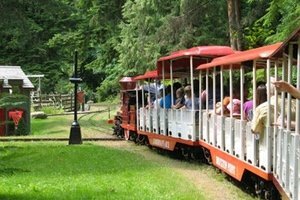 Younger kids will love this fun-filled ride through Stanley Park on a miniature replica of the Canadian Pacific Railway Engine #374. 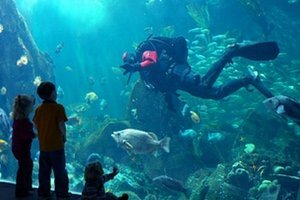 One of the city’s most popular family attractions it operates from mid-June to early September. 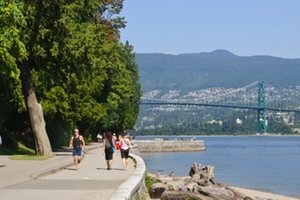 Built to protect the foreshore from erosion, the Vancouver Seawall is the world’s longest uninterrupted waterfront path at around 28 km in length. While you probably won’t want to attack it all at once, the picturesque 9 km Stanley Park section should take around 3-hours to complete. An impressive stadium with a retractable roof that hosts year-round sporting and music events. 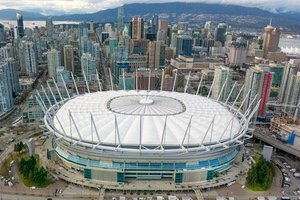 Home to the Vancouver Whitecaps soccer team and BC Lions gridiron team. 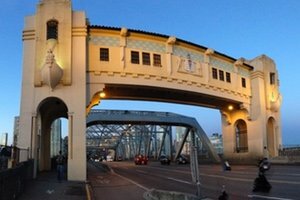 Burrard Street Bridge is an elegant art deco bridge that was completed in 1932. This pedestrian and cycle-friendly bridge make for a nice walk from downtown if you’re headed over to Kitsilano. Look out for the busts depicting Captain George Vancouver and Sir Harry Burrard-Neale. 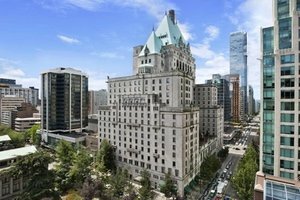 Often referred to as the “Castle in the City”, the Fairmont Hotel Vancouver is a Châteauesque style building in the center of downtown Vancouver that’s hard to miss. The green patina roof is a fixture of the skyline and the grand interior is well worth checking out. On our tour, we might even have the chance to show you where Queen Elizabeth stayed. 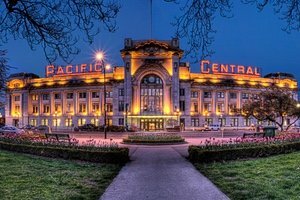 Opening in 1919, the Pacific Central Station is a beautiful railway station that is the final stop for people traveling from Seattle or Portland with two round trips operating daily. 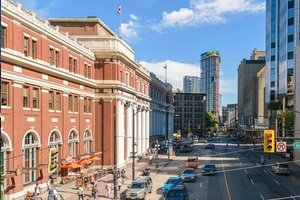 Another piece of architectural history and a major transit hub for Vancouver is the Waterfront Station. The original gothic building was completed in 1914 as the transcontinental passenger train hub, the line extended to Montreal, Quebec, and Toronto. 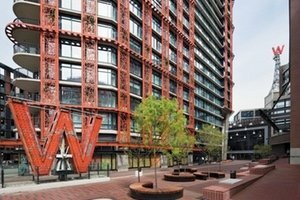 Built on the site of the original and historic 1903 Woodward’s Department Store, the new complex has a funky indoor/outdoor area complete with a basketball hoop and mega tv screen. There’s even a piano you can have a dabble on if you so desire. 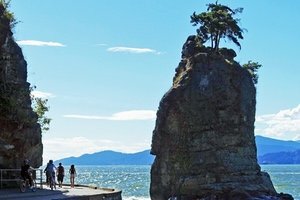 Located in the waters just off Third Beach in Stanley Park, Siwash Rock is a 32-million-year-old sea stack. A Squamish legend tells that a man was transformed into rock as a reward for his unselfishness. 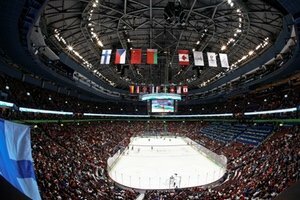 In 2010, Vancouver played host to the Winter Olympics. 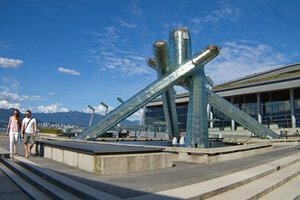 This unconventional-looking Olympic Cauldron located at Jack Poole Plaza was lit during the games. Set against the mountain backdrop, the cauldron is still a major attraction and was lit again during the Pyeongchang Games in 2018. 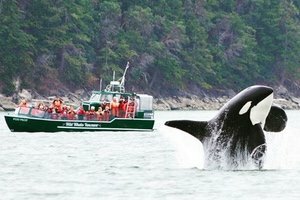 British Columbia is known as a hot-spot for wildlife enthusiasts and particularly great for whale watching and some killer whales can be spotted almost all year round. Venture further beyond the totem poles and you will find the candy-striped Brockton Point Lighthouse. 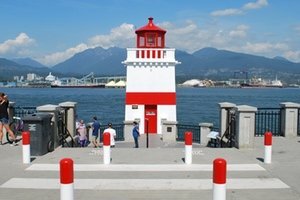 Built in 1914 the lighthouse sits on the most easterly point of Stanley Park and has 180-degree views from Lions Gate Bridge to the city. Though it was cast in 1816 in England, this cannon was brought to Vancouver some 78 years later and used to warn fishermen of the 6pm Sunday close of fishing. 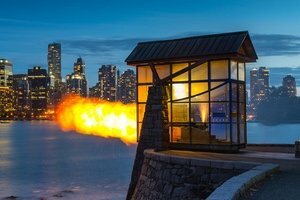 Find out why it’s now named the 9 o’clock gun on our Stanley Park tour. Here you’ll find a fiberglass replica of the original masthead from the 1890 steamship named the RMS Empress of Japan. The original masthead was displayed in the same location until 1958 when it was moved to the Vancouver Maritime Museum. Look out into the water and you’ll spot a statue of a lady perched on top of a rock. 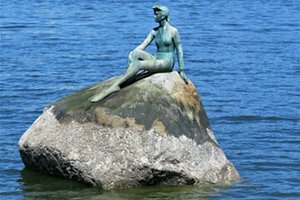 This bronze sculpture by Elek Imredy of a life-size woman in a wetsuit caused a great deal of controversy when it started being compared with ‘The Little Mermaid’ statue that is an iconic symbol of Copenhagen. The second of two wooden arches that have been built here. The first was constructed for the Duke of Connaught during his visit in 1912. Looks can be a little deceiving. The Sam Kee Building (also known as the Jack Chow Building) looks like most other buildings until you walk to the side and notice it’s less than six feet deep. It is recognized in the Guinness Book of Records as the “Shallowest Commercial Building in the World”.